Thirty thousand people have died in Syria’s civil war—and the killing is only intensifying. Obviously, human beings are any war’s most appalling casualties, but there are cultural conflagrations that matter, too—vital spaces laid waste, lost forever. Few alive today have experienced the reputed grandeur of old Warsaw, leveled by Nazi bombs in World War II. How would the celebrated Aztec city of Tenochtitlán have weathered the centuries? We’ll never know, because the Spanish flattened it in the process of conquest, building over it what we now know as Mexico City. The extent of the damage remains unclear, but it appears extensive. Reuters reports that local observers say at least 1,500 stalls are ruined, and were, as of Sunday, still burning. UNESCO Director-General Irina Bokova has issued a missive deploring the destruction. 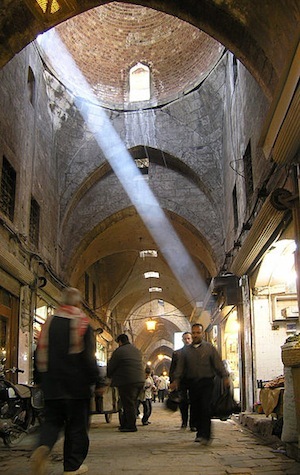 “The Aleppo souks have been a thriving part of Syria’s economic and social life since the city’s beginnings. They stand as testimony to Aleppo’s importance as a cultural crossroads since the second millennium B.C.,” she wrote. I have emails into the UNESCO press office seeking an update on the damage. Though I’ve never been to the Middle East, Souk Madina has long occupied a place in my imagination for the storied richness and diversity of its spices, produce, and meat, the maze of hallways and vaulted ceilings that make up its endless stalls, and the sheer grand chaos of a teeming old market. So I contacted a few US food authorities from whose writings I’ve learned to revere the cooking of the Eastern Mediterranean to get their perspective on the apparent disaster. Gary Paul Nabhan is a Syrian/Lebanese American, a MacArthur “genius” grantee, and a longtime chronicler of the ways food, agriculture, and culture intersect. His 2008 book Where Our Food Comes From: Retracing Nikolay Vavilov’s Quest to End Famine, contains an excellent section on Eastern Mediterranean foodways. Clifford Wright, author of the excellent 1999 book A Mediterranean Feast, which combines history of the region’s cuisine with a large selection of recipes, was equally distressed. From what he’s read, he told me, about 50 percent of the market is destroyed beyond repair. “If that’s true, it’s a real cultural loss, not just for Syrians but for mankind.” He, too, blamed the Assad regime. “Even the Nazis during World War II declared Paris and Rome open cities, meaning they wouldn’t fight for them,” he said. The fact that the regime appears to have attacked the market “shows its base nature”—and also the desperation it feels in the face of the rebellion.